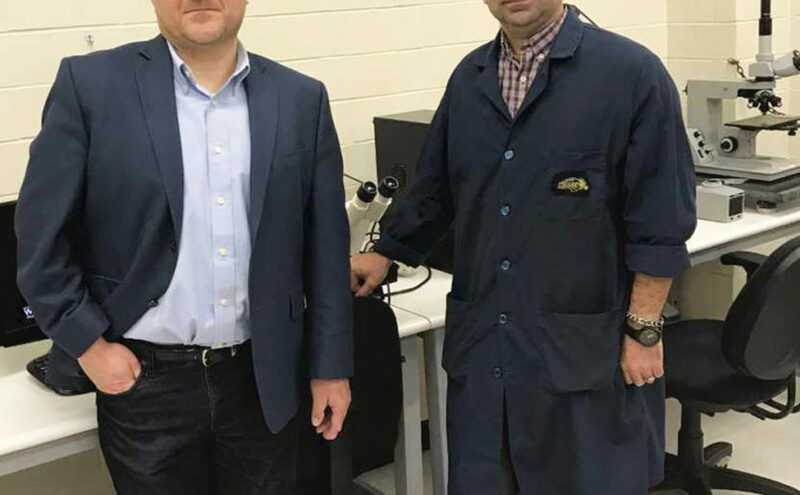 Babak Jahani, an NDSU graduate student, will be receiving the National Science Foundation Student Grant for his research on particulate ceramics called Ultra High Temperature Ceramics (UHTCs) for reinforcing metal matrix composites. For his research, Jahani developed a new composite of UHTCs that can be used for many applications. Jahani suggested a modified route of the powder metallurgy technique for fabrication of metal matrix composites reinforced by UHTC particles. Through studies, Jahani showed there is an optimum volume fraction of UHTC reinforcements in composites, which can guarantee certain physical and mechanical properties. Jahani said future development for this project can be done by the use of different metallic materials and different UHTC materials as reinforcement. The composites can find many applications in aerospace and the energy industry. The results from this research have been published in the Journal of Composite Materials and have been presented in several international conferences. Jahani will also be attending POWDERMET2018. POWDERMET2018 is the largest annual North American exhibit to highlight leading suppliers of metallurgy, particulate materials and metal additive manufacturing. Jahani’s advisor Fardad Azarmi congratulated him, saying it will be great to see Jahani represent the department and university among all the highly prestigious universities there. Jahani has been a teaching assistant at NDSU for the Fundamental of Visual Communication of Engineers and is currently a research assistant for the Materials Characterization Laboratory. He has also been involved with Pai Tau Sigma (Honor Society of Mechanical Engineers), American Ceramic Society and is a professional member for The Minerals, Metals and Materials Society. Jahani received his Master of Science for materials science and engineering in Iran, his Master of Science in mechanical engineering at NDSU and is currently working on his Ph.D. in mechanical engineering. Jahani will exhibit his project at POWDERMET2018 June 17 through June 20 at the Grand Hyatt in San Antonio, Texas.